Autopay Date – If you are enrolled in Autopay, this is the date the charges will be processed and applied to your account. This is always on the due date of your invoice. Monthly Statement Summary – A summary of the last statement balance, payments received, new charges, and the total amount due on the statement due date. 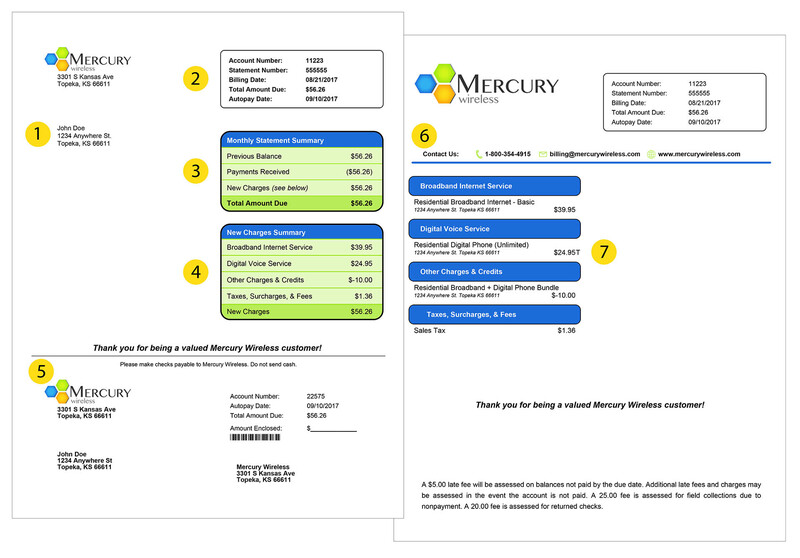 Mercury Wireless bills on a pre-paid basis. This means your statement due date is also the first day of the new billing cycle. As an example, if your invoice is due January 1st, the payment applied to this statement will cover service from January 1st to January 31st. Your billing cycle is based on your installation date. This means the initial invoice will generate within 24 hours of installation and be sent via E-mail or postal mail on the next business day. As an example, if you are installed on January 1st, your initial statement will be sent to you on the next business day, due on receipt. Your 2nd Mercury Wireless statement will generate 20 days before the next due date. This means your 2nd statement will arrive approximately 10 days after the first since we bill on a pre-paid basis. Both statements 1 and 2 are exempt from late charges to allow you time to establish your account, payment methods, and address any questions you have with the initial statements. Mercury Wireless recurring Internet charges are not subject to any taxes or fees. Installation, labor, hardware, custom configuration, or digital phone services will all be subject to local sales tax. Mercury Wireless doesn’t charge any usage, overage, or equipment rental fees. Mercury may, at our discretion, charge late fees, or suspension fees when payments are not processed by the due date listed on the statement. If you upgrade, downgrade, add, or remove any services or if you are assessed any charges, credits, or fees they will be applicable on the next billing cycle. As an example, if your invoice is due January 1st, it will generate on December 10th and any applicable changes to the account will be processed. If you have received a late payment, suspension, or collections notification please contact billing by E-mailing billing@mercurywireless.com, or speak to a support representative by calling (800) 354-4915 to prevent disruption of service.